Are you ready for a little rest and relaxation? 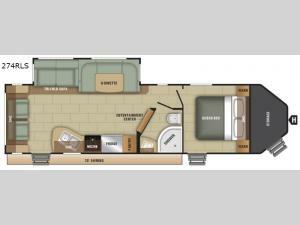 Come choose to camp with this single slide out GPS 274RLS travel trailer. With the front storage area you can easily store camp chairs, fishing poles, or coolers. In the rear you will find the living area and within the slide out there is a tri-fold sofa and a u-dinette. Both the sofa and dinette are a nice place to visit with your family and friends and at night you can easily convert the sofa and dinette into additional sleeping space. The private front bedroom is ideal for mom and dad. You will also find that this model has two entry doors so now you can slip out to go on an early morning fishing trip without waking any sleeping campers!